This remarkable new book, the first of its kind, is an analysis of a phenomenon that biblical scholars have scarcely taken notice of, much less studied critically—the use of the Bible in advertising. Focussing on the figure of Eve, Admen and Eve shows how she has become the ultimate postfeminist icon of female sexual and consumer power, promoting self-regarding individual choice over collective political action for today’s 'I'm not a feminist but ...' generation. Contemporary advertising, Edwards shows, deploys a collage of images simultaneously reflecting and dictating the ideals and ideologies that inform much of Western culture. Exploiting the cultural mythology that surrounds Eve, advertisers constantly recycle images of this biblical figure because she is easily recognizable by the target consumer. In so doing, they are shaping how women and men see each other and themselves and how they treat each other and themselves, persuading them to become their culturally dictated dream through the products they consume. Eve in advertising is then a revealing example of how the Bible functions today. But Admen and Eve is not a value-free and apolitical analysis; it is an incitement to the exposure and subversion of today’s dominant cultural attitudes to gender roles. Katie B. Edwards is Lecturer in Biblical Studies, University of Sheffield. What Has Postfeminism Got to Do with It? 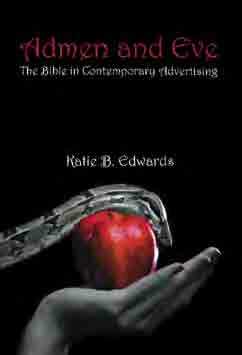 E[dwards] offers an articulate insight into the ways in which contemporary advertisers repeatedly ‘recycle’ motifs of Eve … In doing so she provides a refreshing analysis of how biblical stories continue to have a significant impact upon modern cultural attitudes … E. opens up the field of biblical reception criticism to include an array of images from popular culture, and successfully challenges the common argument that much popular culture is too ‘frivolous’ or ‘insignificant’ to warrant academic attention. H. Morse, Society for Old Testament Study Book List 2013.